Facebook unveiled major upgrades to fan Pages on February 10. If you have not yet upgraded your Page(s), you can do so here. I recommended choosing the Preview option first to get a feel for what’s changed. However, on March 10, the upgrade will be automatic, so you may as well switch before then to get used to it. ALL Page Admins who have upgraded their Page already (or are currently using Facebook in Page Preview mode), will view *your* Page in the upgraded design whether you’ve upgraded yet or not. Basically, it’s the same as the new Profile design rollout – anyone who upgraded sees everyone else the new way. 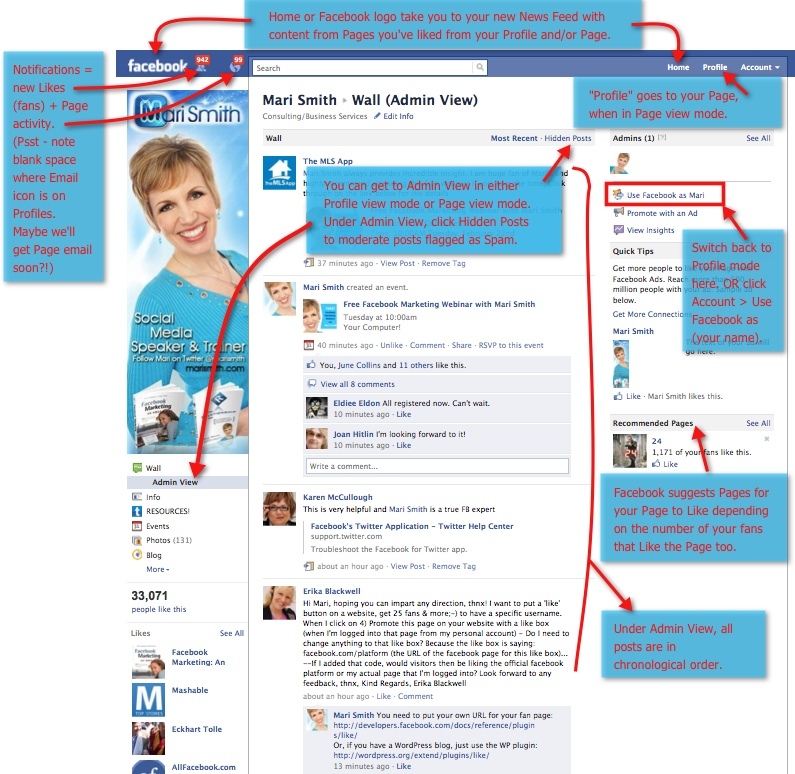 Post content* AS your Page on the walls of Pages you’ve liked. (Types of content depend on individual Page settings, e.g. Admins can turn off their wall completely, and/or allow uploading of photos and videos). Like and comment AS your Page on any wall posts of Pages you’ve liked. Like and comment AS your Page on any Facebook user’s Profile where the person has set their wall to be viewable by Everyone. 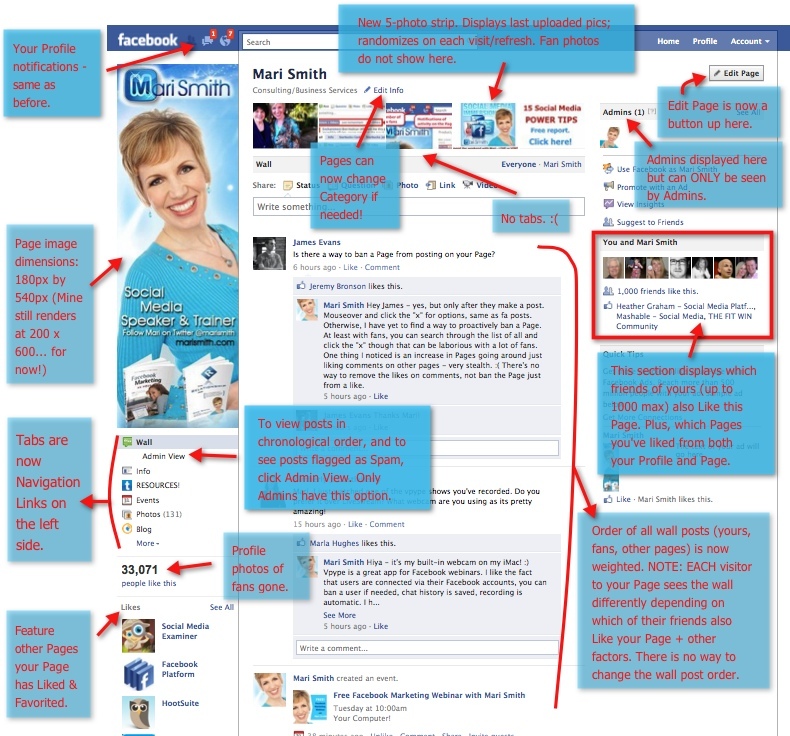 (Note: Pages cannot initiate posts on Profile walls; they can only comment/like on existing posts). Like and comment AS your Page on all posts on your own Page (default setting when in Page Mode; you can change this to post as your Profile anytime you wish). See red on-site notifications of new Likes. Pages who Like your Page are not counted. See red on-site notifications of Page activity. View your new News Feed – complete with Top News and Most Recent – of all Pages you’ve liked as your Profile or Page. *HOT TIP: Always sign your name at the end of every post/comment when posting as your Page. This adds the personal touch and increases engagement. Of course, if you’re like me and your Page is already in your own name, there is no need to sign posts/comments. But, if your Page name is “ABC Business Rocking At XYZ!” then I really feel it is a step backwards in our uber social world to now “hide” behind your business name while networking with other business Pages. This is probably one of the most significant changes that many users are not happy about. Your Page wall is now no longer in chronological order. Rather, all content now passes through a weighting system and the most popular (engaging) posts appear at the top. This filter applies whether posts are made by you, your fans, or other Pages who Like your Page. All Pages have just two wall filters at the top: Everyone or posts by the Page. Only posts by Page are in chronological order. NOTE: Each person/page viewing your wall will see a *different* order of posts because the weighting system selects posts depending on which Facebook friends of each fan are also engaging with your Page. In other words, whether you are logged in to Facebook as your profile or your Page, when viewing any Page that you Like, the order of posts on the wall is determined by which of your friends also Like and engage with that Page, plus other factors likely similar to Facebook’s NewsFeed EdgeRank. Admin View instantly shows you your Page wall in chronological order. This is very important when moderating so as to not miss any posts. Unless, of course, you’re keeping a close eye on your Notifications. In addition, the Spam filter has changed to “Hidden Posts” now shown under Admin View. To manage any posts flagged as spam, mouseover each one, click the “x” and select from the option you wish. Unmarking a post as spam posts it back onto the wall for all to see. You can also ban users this way – whether a fan or another Page. NOTE: At this time, there is no way to ban a Page from your Page as and until that Page makes a post or comment. Unfortunately, I have seen a number of Pages (with long fan Page names!) going around in a rather spammy fashion liking posts and comments and the Page Admin has no way of removing those likes or of banning the Page. Another much-requested feature, you can now enter a list of trigger words – any time a fan or another Page uses any of your trigger words, their post or comment will not be published on your wall. Posts will not appear on the wall; rather only Admins can see these posts under Hidden Posts in Admin View (see above). Comments flagged as spam will still appear inline but in gray. This is a bit trickier to spot and moderate. If you tend to get a lot of spam links posted to your wall, you could include “http://” and “www” in the Moderation Blocklist to prevent the posting of links on your wall. Five photo-strip at the top: This new feature is identical to the new Profile design. These photos are the last ones you (as the Page Admin) either uploaded or tagged your Page in and will change any time you upload/tag new photos. Any photos uploaded by people (fans or other Pages) who Like your Page will not show in the photo-strip. To remove a photo from the display, mouseover and click the “x”. (Hidden photos will still be accessible). You can get creative and use this valuable real estate for branding, special offers, tips, etc. See this post for ideas. Photo viewer: Facebook introduced a new way to view photos anywhere on the platform. See my earlier post here on how to use the five photo-strip + photo viewer as a marketing tool. Profile picture size: Previously, the max dimensions for Page profile photos was 200px wide by 600px high. This has been reduced to 180×540. (My profile pic is still rendering at the 200×600 dimensions even with the Upgrade. Likely this will change at some point). Tabs are now navigation links: All tabs have disappeared and are now links on the left column. This new navigation design is identical to the new Profile design, and also the Place Pages which have been around since Facebook Places launched last August. It’s interesting there was such an outcry with the merged Place Pages and Business (Fan) Pages, when all Pages will have this new look and feel come March 10, 2011 anyway. As a small consolation, you can now *rename* any third party app to make it more prominent, if you wish. Go to Edit Page > Apps > go to the App you want to edit, click Edit Settings > type in a new Custom tab name > click Save > click OK. 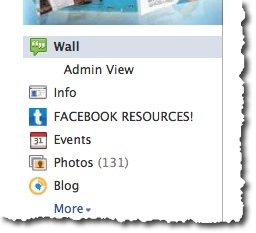 In the screenshot below, I created “FACEBOOK RESOURCES!” using the TabSite app. Reorder links: So long as you have more than seven links, you should see a “More” link at the bottom. Click that link, then click the “Edit” link. Your links can now be reordered by simple drag and drop. TIP: Place your welcome/landing tab at the very bottom so new visitors to your page will automatically see the full list of your navigation links. Check or uncheck the Email Notifications box to receive emails or not. NOTE: Any additional Admins assigned to your Page will need to adjust their own email notifications under their personal Profile. Click Account > Account Preferences > Notifications > Pages > Change email settings for individual Pages > in the popup box, check or uncheck each Page depending on email preferences. In the screenshot above, you’ll see there is another option under “Your Settings” and that is you can choose to *always* post on your Page AS your Page (checked). Or, post on your Page as your Profile (unchecked). Many Page Admins are delighted with this option, as the inability to post as themselves on their own Pages was a hindrance in the past. 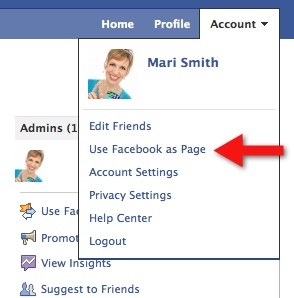 For me, given my Profile and Page are in my name, I’m happy to leave the default as Page only. 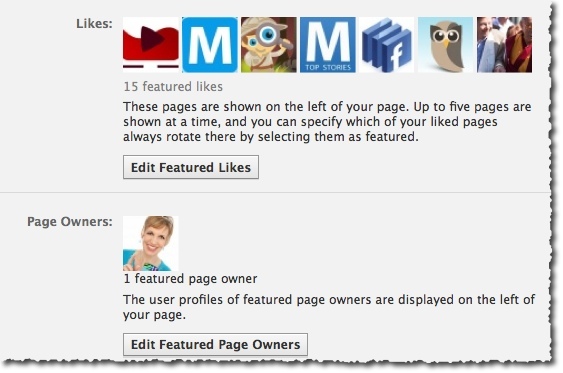 Just as you can feature Lists (or Groups) of Friends on your personal Profile, you can elect to feature other fan Pages you’ve liked on your Page. These were previously displayed as Favorites. On the left side, your Page only displays five featured Pages but you can add as many as you wish and they rotate on each view/refresh. Change the setting under Edit Page > Featured > Edit Featured Likes > in the pop-up box you’ll see ALL Pages your Page has liked > check the box next to the ones you wish to feature then click Save. You can also choose to feature specific Admins (Page Owners) as you can see in the screenshot above. This is likely useful for larger businesses/brands who wish to give a personal touch to their Pages and have the people who like them know a bit more about who’s moderating the Page. Any FBML content you add to your Page up to and including March 10, 2011 will continue to be supported. After March 11, 2011 you’ll need to use iFrames. With iFrames, you need to add your own app to your Facebook Page. With iFrames, you can skin a page to 520px wide on your own website where you host your own media and embed that page in an iFrame. 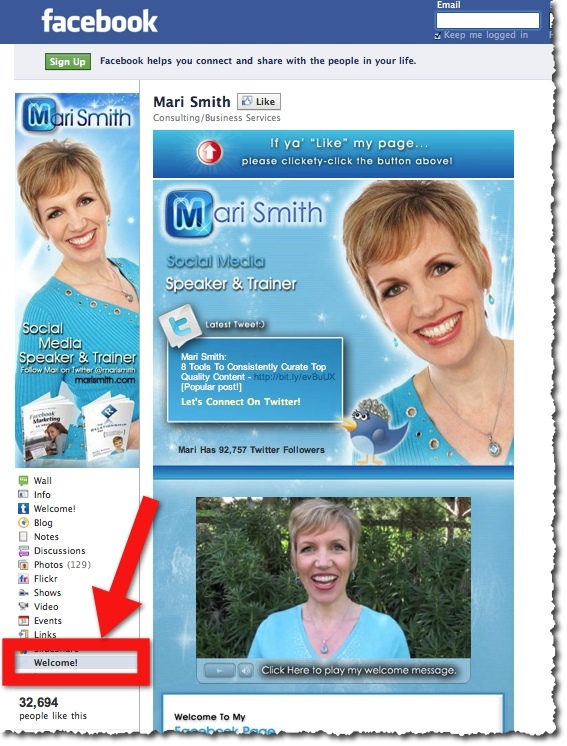 See this post for instructions on adding an iFrame to your Page . I trust this post helps lift the fog and demystifies some of the wild and crazy changes lately!! Let me know in the comments below what your favorite new features are… and the ones that are driving you a bit batty!! 🙂 Also, do visit my fan Page for lots of useful tips and to post your question on my wall. Enter your first name and email below to secure your seat now! *Please double-check your email for accuracy. Your email address is never shared with anyone.